Sometimes you don’t want to know too much about a good thing. Do you really want to learn what’s in that delicious sugary soda you drink every day? Do you really want to find out all the answers to Adventure Time’s mysteries? 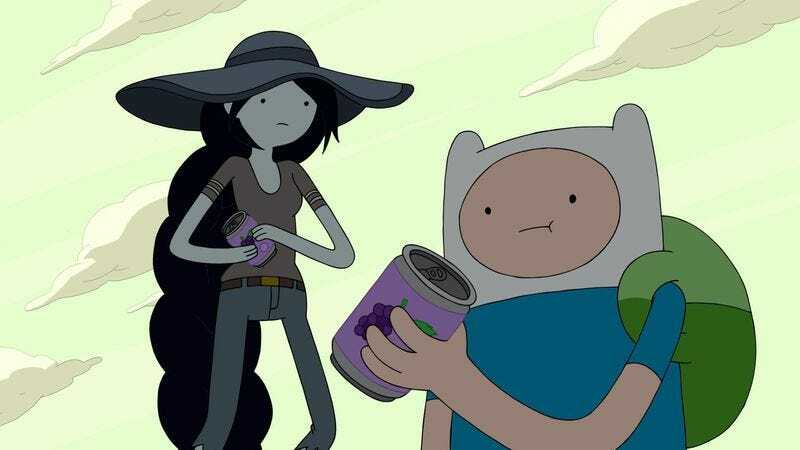 “Dark Purple” addresses both these questions with a story about Susan Strong discovering the secret of Super Porp, the refreshing grape beverage that brings joy to people all over Ooo. Teaming with two of her friends, Susan infiltrates the Super Porp factory to save a kidnapped baby Hyooman, uncovering a bizarre system built on slave labor and brand awareness. But before Susan Strong gets involved, the episode offers the Super Porp quest to Finn, Jake, BMO, and Marceline. 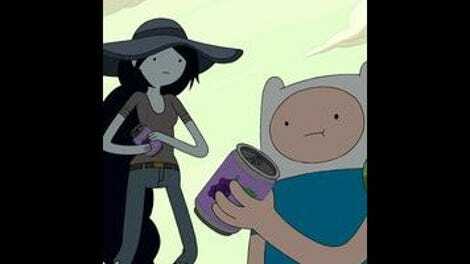 Finn wonders how the same beverage Marceline drank as a child could still be produced after the Great Mushroom War, but just as he starts to consider venturing out to solve this mystery, Jake steps in to put a quick end to it. Sure, they could go on an adventure and fight some strange new enemy, but Super Porp is a good thing. They should just enjoy what they have instead of digging too deep into the logistics behind it. Jake’s protestation can be interpreted a number of ways. He could be the voice of the consumer that chooses to remain ignorant about the negative qualities of a product or company because of the personal benefits, taking a passive stance that doesn’t get in the way of pleasure. But he could also be the voice of this show’s writers, addressing the fandom’s need to get answers to Adventure Time’s many mysteries. These fans have a good thing with the show the way it is now, and as the writers delve deeper into the backstory of Ooo, they run the risk of disrupting the magic that captivated audiences in the first place. But that hasn’t happened yet. The show has only gotten more engaging as the scope has expanded, and “Dark Purple” is a fine example of how shifting the focus beyond Finn and Jake hasn’t diminished the quality of the storytelling. Written and storyboarded by Adam Muto and Adventure Time newcomer Sloane Leong (yet another voice from the alt-comics world), this episode delivers all the action, comedy, and weirdness you expect from this series, it just doesn’t feature the usual players. Adventure Time has become a place for artists to tell animated short stories in a world with very few creative limitations—the content has to be all-ages, but there’s even some flexibility there—and the ensemble has gotten so big that there’s a cast member for any type of plot. (If not, these creators can feel free to add someone new.) It’s been three seasons since Susan Strong last appeared on this series, but Muto and Leong wanted to use her, so now she’s back. No explanation why we haven’t seen her. No catch-up on what she’s been doing while she’s been off-screen. She’s just back and in the spotlight, and that kind of unpredictability is a big part of the fun of watching this show. At this point, you never know what you’re going to get with any given episode of Adventure Time. Will it be a fantasy quest this week? A psychological examination? What about a critique of consumerism? This show has become incredibly malleable because of how basic its foundation it (something I wrote about in this week’s A.V. To Z on the best animated series), and as it continues, the creators are moving further and further outside the box. This week’s episode is about Susan Strong shutting down a soda factory after discovering that it stays in business by transforming babies into corporate mascots, and that lands on the lower end of this show’s absurdity spectrum. Sloane Leong has created some truly disturbing comics, so I was a bit nervous about the gross-out factor of this week’s episode, but there was no need to worry. There are some grotesque moments in the Super Porp factory, but those scenes are more creepy than nasty. And because this is Adventure Time, the creepiness is offset by a palette of bright pink and purple, two colors that don’t get much play when it comes to horror stories. The highlight of the episode is a chilling, yet hilarious, scene where Susan discovers the mutated slaves working in the porp factory, stirring the neon liquid as they sing the Super Porp jingle, transformed from a peppy ditty to a languid dirge. It’s one of those signature moments of strange that this show has built a name on, the kind of odd, discomforting scene that doesn’t feel like it belongs in a children’s show. In the end, Susan defeats Cheryl, the face of Super Porp, rescues the baby, and destroys the factory, effectively putting an end to this centuries-old business. “Without a new Cheryl, brand awareness will go down the toilet,” Cheryl says before Susan knocks her out. “Our in-your-face flavor will be lost forever. Who are you to condemn our ancient ways?” She’s a hero, and she’s doing the right thing by destroying a figure that peddles garbage to kids. Maybe these cartoon spokespeople need to die so that children aren’t as attracted to products that are detrimental to their health, which is a bold stance for a children’s animated series that lives and dies based on ratings numbers and advertiser interest. Cartoon Network announced today that there will be an Adventure Time Special miniseries later this year, which will involve Finn and Jake facing off against a new enemy while Princess Bubblegum unleashes ghosts from Marceline’s past. It will be interesting to see which creators work on the miniseries, and how this special differs from the main series. As much as I enjoy the opening scene, I do get a bit wary when Finn and Jake’s world starts to look too much like our reality. That said, it’s fun to see the gang as slackers hanging in the local convenience store parking lot. There’s some really great action choreography in Susan’s fight with the porp dog or whatever the hell that thing is. I love the shot of her running up its arm to punch it in the face. They sure do say “porp” a lot in this episode.